Just reach up and WOW - you're holding a long white candle! Then you light it! Everyone's gobsmacked as they watch the flickering flame. You've just produced a 'real' candle from thin air! Where did that candle appear from! Perfect for any church service - especially around Advent or Easter. Fun in a school assembly. And don't forget parties or celebrations. "Opps - we forgot to get candles for the cake." Then magically make one big candle appear in their place. Ideal for illustrating any message on Jesus the light of the world. Present this along side the Easter, or Paschal candle illustrating the promise that Christ will appear again - to everyone's surprise! Make this a surprising start to the lighting of the first Advent Candle! Just the right size to hide in the palm of your hand. The holder keeps it ready for the magic moment! BONUS 1: Free 18 inch silk Hankie. Make the candle magically appear from behind the hankie. Adds colour and mystery to the effect! 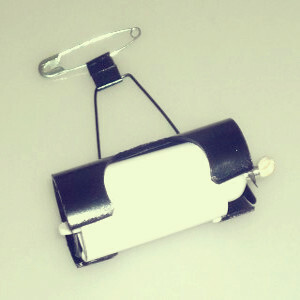 BONUS 2: Free Pro Appearing Candle Holder - this specially designed holder attaches to any item of clothing and allows you to produce the candle at a moments notice. Very easy to do - the gimmick does all the work for you. Guaranteed to get a WOW! This is one magical appearance that will surprise everyone. 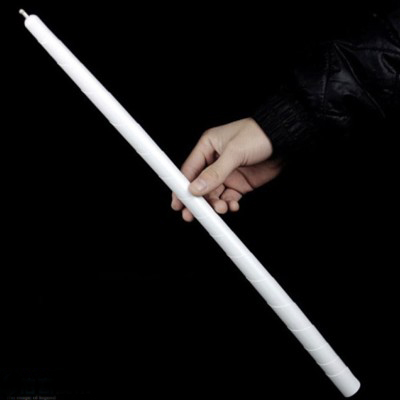 You will receive: x1 gimmicked appearing long white candle, x1 18 inch silk, professional holder and written instructions. "Thanks for the suggestion for using the appearing candle for a Christingle service. I explained the significance of the fruits by producing flower boxes from the dream bag and tying it in to Jesus being there at creation, from John's Gospel. I then produced the fake orange for the world, from the bag, a mouth coil for the ribbon to represent the blood of Christ (we eventually got to the right colour) and finally I produced the candle for Jesus as the light of the the world, also from John's prologue. All this was really easy to do, even with a vent puppet on one hand, and clearly visible even in church of 400 people." Appearing Christmas ORANGE - For a Wonder Filled CHRISTINGLE - A Mandarin Orange Magically appears in your hands or a gift bag! Best Seller - Instant Nativity! - No need to rehearse! Fun story telling with up to 5 volunteers. Best Seller - 4 Presents & A Baby - Our #1 Xmas Trick - The Nativity Story Told with 4 Objects and a magical twist! Advent Candle Thru Silk - Colourful seasonal magic with a Light of Christ message. Colour Changing Christmas Candle - Jesus Light of the World - Kids LOVE the colour changes. Perfect for any party or celebration.